HERE WE GO... SEPTEMBER 2016 IS PUPPY MILL AWARENESS MONTH!! 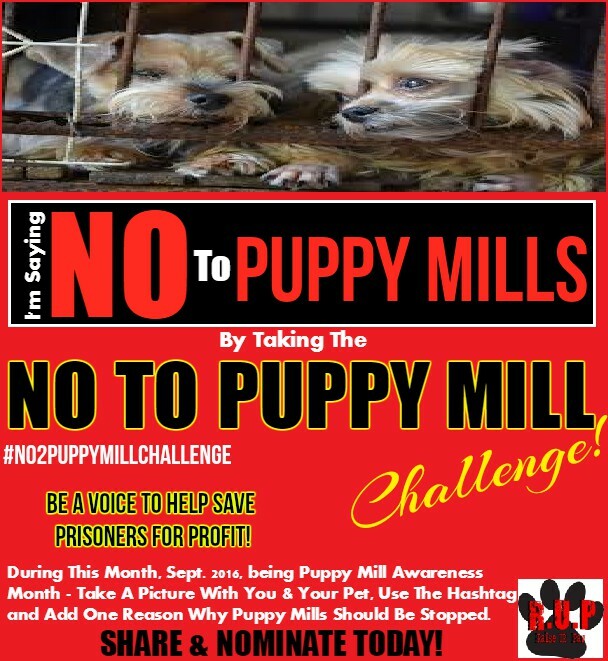 That's Right Folks, for the month of September, Animal Angels from all over the World are joining united to make a stand against these inhumane and cruel "Mills of Misery" -- and it is time that these mass dog-breeding operations and their crimes of mistreatment, negligence and inhumanity be brought to an end once and for all. We at RAISE UR PAW, a Canadian Federally Incorporated Not-For-Profit, are joining forces and reaching out to each and every individual to JOIN IN and take the challenge, raise awareness and "Raise Ur Paw" against these inhumane establishments of misery and suffering. ARE YOU UP FOR THE CHALLENGE?? READY TO CHALLENGE OTHERS TOO??? 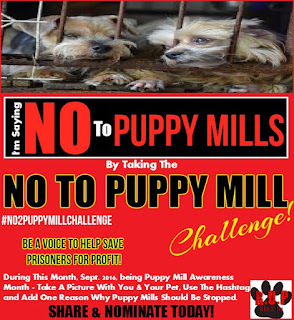 During this month, we are requesting everyone to post their pictures with their pets, and attach the HASHTAG: #No2PuppyMillChallenge, along with 1 Reason why puppy mills need to be banned and stopped permanently. You can nominate your friends, family, groups, celebs etc... and spread the message worldwide, challenging everyone to become involved in the fight against these horrific mills around the globe. Tag your photos to @RaiseUrPaw, so that we can retweet to show countless others that you too Raise Ur Paw Against Puppy Mills and that you encourage adoption and fostering of sheltered animals instead of buying and contributing to puppymills -- cause we all don't want to participate in any misery or suffering of life..
Let's UNITE AS ONE and WORK TOGETHER as ONE POWERFUL FORCE to BRING PUPPY MILLS to an END --- Raise Ur Paw, Be A Voice and TAKE THE CHALLENGE TODAY :) Your Support & Aid is Urgently Needed. THE MONTREAL BAN ON PITBULLS: OUR RESPONSE!